February – And by my spade I delve my lands. April – And here i hear the birds sing. June – And I weed my corn well enow. August – And here I shear my corn full low. October – And here I sow my wheat so red. December – And at Christmas I drink red wine. Author Toni Mount is back again, but this time with an in-depth look at daily life in Medieval England. Her book, A Year in the Life of Medieval England , explores war, medicine, marriage, disputes, work, and cooking. A fascinating almanac of bits and bobs about Medieval England from the most most mundane, to the most important events in its history. Mount drew on chronicles, letters, wills, diaries, coroner and court rolls to give readers this glimpse into the past. The book focuses on the High to Late Middle Ages, the period between 1066 to 1500, with an entry or two for every day of the year. Where there were no significant historical events for a particular day, Mount offered a recipe or an interesting medical remedy relevant to that time of the year. Men knocking down acorns to feed swine, from the 14th century English Queen Mary Psalter, MS. Royal 2 B VII f.81v. (Wikipedia). In September, all fruits that is ripe is good to eat, and blood is good to let (phlebotomy).For those who letteth him blood on the 17th day for the dropsy, neither the frenzy (insanity) or the falling evil (epilepsy), that year shall he have” ~ W.R. Dawson, A Leechbook of the Fifteenth Century . Another interesting aspect to this book was that alongside events and curious facts, readers learn about the cycles of the medieval year. Dates that were important to medieval people but no longer have much meaning included Martinmas the week starting November 11th, when animals were slaughtered for food in the coming winter months. Or Michaelmas, on September 29th, a time when the harvest was over and rents would be collected. There is a lot of bouncing around in the book since the days are in order but the years are not. If a monarch was born late in the year, but died early in another year, his story is told backwards. However, Mount is always good about referencing the beginning and continuation of a story at the end of each note, such as May 8th: Jack Cade’s Rebellion, ending with a note in brackets (see July 12), making it easy if the reader wants to jump back and forth to knit together a particular story. 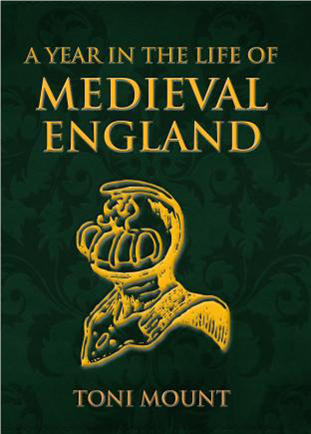 Toni Mount’s A Year in the Life of Medieval England offers a captivating look into the daily lives of medieval people; a sort of #OTD (on this day) collection for anyone interested in history beyond epic battles and momentous events, yet still providing a nice blend of vital dates, advice, humour, and daily perspectives. Toni Mount is a popular medieval historian and experienced speaker. She makes her living giving talks and classes on everyday life in the medieval period.